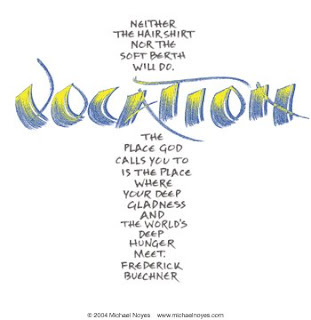 "Vocation is about finding what you are best suited to. It's about finding your mission in life, discovering who God has created you to be and what tasks he has created you to carry out in this world. Everyone has a vocation, and finding it truly is the single event that will create more happiness in our lives than anything else. Life, therefore is about vocation. It is about seeking and finding what God created you for - and then doing it. It is through this process that God will transform you into the best-version-of-yourself and the world into the place he intended it to be." So finding our vocation "will create more happiness in our lives than anything else..." And indeed, I can say that finding one's true vocation really is about finding the treasure; or rather, finding a treasure chest with my name on it, unlocking it and spending the rest of my life gradually extracting and exploring its contents. That doesn't necessarily mean it will all be cosy and easy, or that the treasure chest contains a bed of roses. In fact, finding one's treasure can be scary - at least at first - and the treasure chest contains risk and challenge and unattractive bits alongside joy and excitement, but deep down there's a rightness and a peace to it which can somehow override the initial scariness and assure us that the journey will be worthwhile. What a thought provoking post! I am having one of those periods of discernment and this just nails where I am!